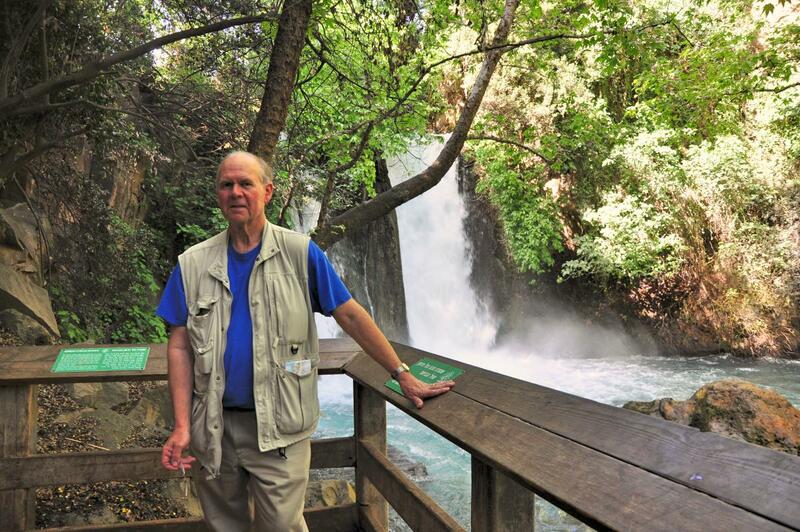 OT Baal-hermon, Site of Banias/Caesarea Philippi? Caesarea Philippi/Banias. Some scholars identify this site with Old Testament Baal-hermon. Photo ©Leon Mauldin. Our photo features Banias, better known to most Bible students as Caesarea Philippi, because it was in this region that Peter made his great confession of faith in Jesus as Messiah, the Divine Son of God, and Jesus promised to build His church (Matt. 16:13-20). On the lower left you can see the grotto of the god Pan, where idolatrous sacrifices were offered. To the right you can see niches carved into the face of the rock; these formerly contained idols. Banias/Caesarea Philippi is located at the foot of Mt. Hermon. From here flows the Banias River, which merges with other sources to our south (about-face from perspective in photo). Banias River, a major source of the Jordan. Photo ©Leon Mauldin. 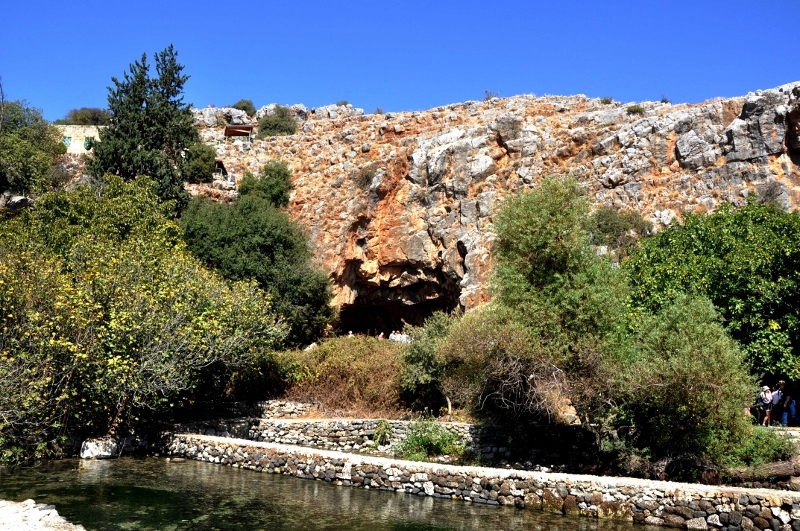 We know that Banias/Caesarea Philippi was a site for pagan worship in the AD 1st century. There is evidence that this had been a center of idolatrous worship for centuries prior to Jesus’ ministry, reaching centuries back to Old Testament times. ¹Orr, J., Nuelsen, J. L., Mullins, E. Y., & Evans, M. O. (Eds.). (1915). Baal-Hermon. In The International Standard Bible Encyclopaedia (Vol. 1–5, p. 347). Chicago: The Howard-Severance Company. 2 Keil, C. F., & Delitzsch, F. (1996). Commentary on the Old Testament (Vol. 3, p. 442). Peabody, MA: Hendrickson. ³Easton’s Bible Dictionary. New York: Harper & Brothers. In our previous couple of posts we were looking at Caesarea Maritima, Herod’s capital city on the Mediterranean coast. 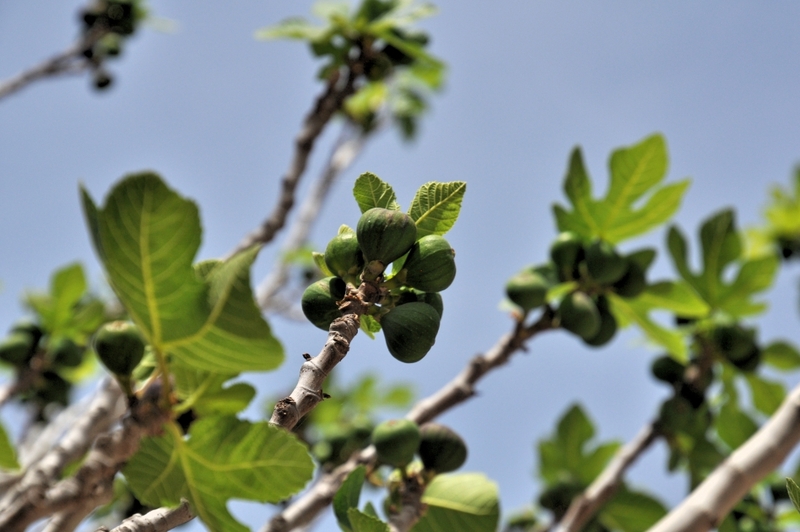 Presently we are considering another Caesarea, up to the north at the foothills of Mt. Hermon, Caesarea Philippi. This area was ruled by Herod’s son Philip. On-site Bible study can be a thrilling experience; to be able to walk in the steps of Jesus and various Bible characters is a wonderful opportunity. 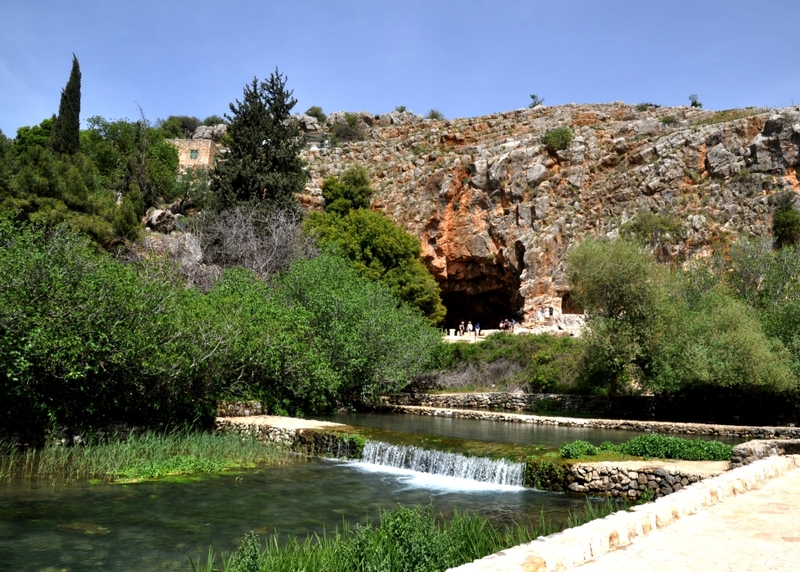 We had such an occasion in a visit a couple of weeks ago to Caesarea Philippi. It was in this region that Peter made his confession of the Christ, and Jesus promised to build His church. 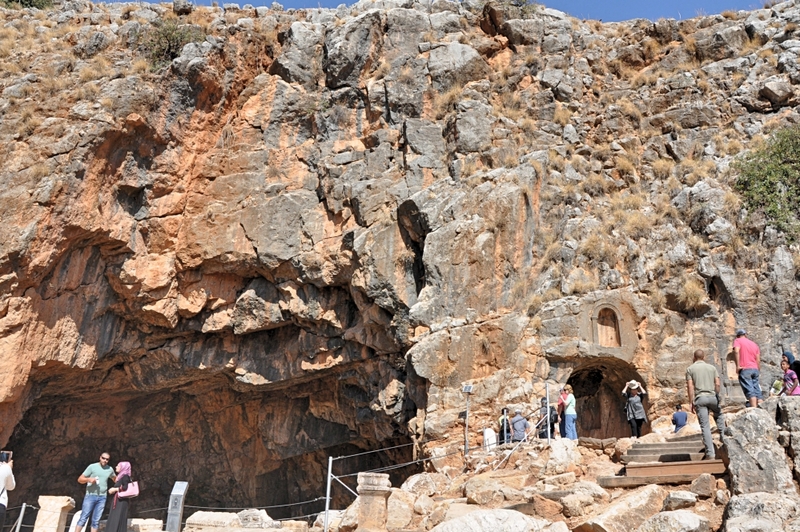 Caesarea Philippi. 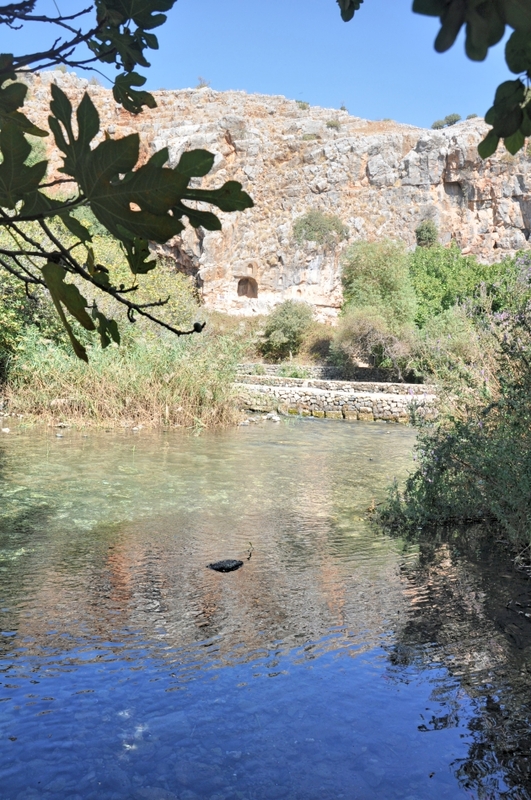 Grotto of Pan (center), and Banias River. Photo by Leon Mauldin. Now when Jesus came into the district of Caesarea Philippi, He was asking His disciples, “Who do people say that the Son of Man is?” 14 And they said, “Some say John the Baptist; and others, Elijah; but still others, Jeremiah, or one of the prophets.” 15 He said to them, “But who do you say that I am?” 16 Simon Peter answered, “You are the Christ, the Son of the living God.” 17 And Jesus said to him, “Blessed are you, Simon Barjona, because flesh and blood did not reveal this to you, but My Father who is in heaven. 18 “I also say to you that you are Peter, and upon this rock I will build My church; and the gates of Hades will not overpower it. 19 “I will give you the keys of the kingdom of heaven; and whatever you bind on earth shall have been bound in heaven, and whatever you loose on earth shall have been loosed in heaven” (Matt. 16:13-19 NASB). 1. This passage does not teach the primacy of Peter. What Jesus said here to Peter regarding his apostolic authority was said just two chapters later to all the apostles Matt. 18:1,18. 2. Regarding the “binding” and “loosing:” the point is not that Peter or the other apostles would bind/loose something on earth and then God would bind/loose it in heaven. What they bound on earth was binding because God had bound it in heaven; what they loosed on earth had authority because God had loosed it in heaven. The rendering of the Christian Standard Bible (Holman) is, “I will give you the keys of the kingdom of heaven, and whatever you bind on earth is already bound in heaven, and whatever you loose on earth is already loosed in heaven” (Matt.16:19). The apostles did not have inherent authority; they were the instruments through which God’s revealed will was made known. 3. Jesus was anticipating the events of Pentecost, Acts 2. It was at that time the Spirit descended upon the apostles, empowering as Jesus had promised, and salvation through the crucified and resurrected Messiah was proclaimed. This was the beginning of the church, and the establishment of the kingdom, the reign/rule of Christ. You are currently browsing the archives for the Caesarea Philippi category.